But here’s what I love. Something happens in the middle of the song when Alex and Jennifer aren’t even on-camera. The commercial has broken away from them for a shot of the crowd, but you still hear them. And then right in the middle of the lyrics, Alex says, “Thank you” to Jennifer. Here is a young man struggling to make it in a very difficult business singing with one of the most proficient musicians in the world, and in the middle of a song, he has the presence of mind and takes the time to thank her. That is absolutely precious. And unfortunately, most people will probably miss that moment in the commercial because it happens so fast and off-camera. But it touches my heart to the core every time. Recently, we heard Bill Hybels speak at the Global Leadership Summit. One of the points he made was that we as a society have lost the practice of being polite. He said we are losing respect for others in just offering simple kindnesses and living politeness toward one another. And I think in many ways, he’s right on point. We are no where nearly as polite as my grandparent’s generation. It’s been a slow decline and like the frog in the kettle, we’ve settled into an attitude that we have a right to voice everything on our mind without consideration for others, without using kind words, and without speaking truth in love. And thus, our words, while possibly true, show little to no respect for the other person. Is it possible that we don’t have a politeness problem so much as a gratitude deficiency? First, I once again teared up at the Lovely Day commercial. We received an email from an attender of one of our marriage retreats thanking us for the impact our words had on her marriage. We got a text from our sister-in-law expressing such gratitude for us coming to help them move. Expressing gratitude is so powerful to everyone involved. It is the ultimate form of politeness and respect. But as the one being thankful, you place yourself in a humble position acknowledging that we deserve nothing. All we receive is a blessing and a gift that someone else chose to extend to us. Everyone wins when gratitude is at the heart of an interaction. HOW CAN YOU INCREASE YOUR THANKFULNESS? Develop the habit of gratitude. This is not just in saying “thank you” which we should do regularly. But it is a heart of gratitude. 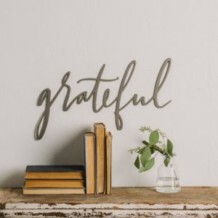 I know several people who take the time first thing in the morning or at night before bed to write down what they are thankful for in that day. When we begin with a heart of gratitude, it will come out in our actions and words. Be polite toward others. Through politeness and respect of others, we begin to value the people God has placed in our lives – from casual acquaintances, to neighbors, to coworkers, to dear friends, to our precious family. By valuing others, we increase our thankfulness for the impact they have on our life. Fill your mind with positivity. The wonderful thing about modern technology is we have access to so many forms of art. We can look at beautiful works of art. We can read uplifting poetry or stories. We can watch movies or videos that inspire. We can hear music that feeds our soul. We can watch a dance that moves us deeply. Or maybe you just need to get up and dance or sing a song. Any way you experience joy will make you thankful to be alive and in relationship with the amazing people around you. We pray you have a very Happy Thanksgiving!